Transplanted from Yorkshire, England, Andrew Pighills is passionate about his english garden heritage and the art of creating stone structures. 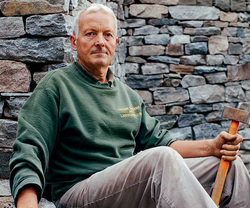 He received his formal horticulture training with the Royal Horticultural Society and has completed stone building apprenticeships with master stone artisans in the Yorkshire Dales, including certification with the Drystone Walling Association of Great Britain. His many years spent creating gardens and building traditional stone structures in his native England has earned him a devoted list of private and public clients both here in the USA and in England. In addition to creating gardens and garden structures, Andrew shares his knowledge and expertise by teaching dry stone wall building workshops in and around New England. Andrew is one of ten stone masons to be profiled in the "Stone Primer" by Charles McCraven. 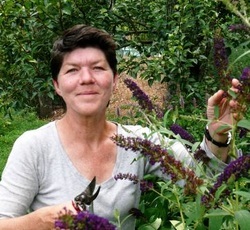 Michelle Becker has come to gardening through a multi-disciplinary background in fine arts (painting), architecture and design. She has traveled extensively in Europe and Asia and lived in France, Italy and England, experiences which have contributed as much to her sense of light, color, proportion and structure, as they have to her knowledge of garden design. Michelle's approach to exterior design is that of a landscape painter, composing form, structure and perspectives with shape, color and texture. She communicates these ideas through working drawings, sketches, and other visual aids color to enable clients’ to visualize the end result of their landscaping plans. Michelle won a National Garden Design award in 2002 for a formal parterre she designed in New York City. Andrew and Michelle have combined their unique and extensive skills, and in forming English Gardens and Landscaping, create exceptional and unique gardens.